Today is the 4th of February and is the World Cancer Day –authorities in countries around the world including Samoa will raise awareness and encourage prevention, detection and treatment. The World Heath Organisation (WHO) says cancer is the second leading cause of death globally, responsible for an estimated 9.6 million deaths last year. Globally, about 1 in 6 deaths occur due to cancer and approximately 70 per cent of deaths from cancer occur in low and middle-income countries. In Samoa, cancer runs second in terms of diseases with the largest number of fatalities. 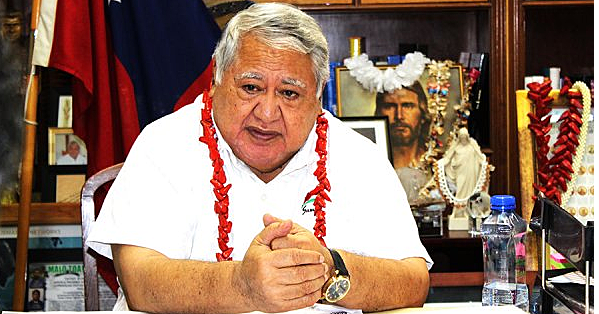 The Minister of Health Tuitama Dr. Leao Tuitama, who joined other dignitaries in a service yesterday at the Congregational Christian Church of Samoa at Vaiala, said cancer is the second highest killer of Samoans after cardiovascular diseases. “It is a day to highlight the effects of cancer and to ensure works that are done in curing those affected, and for everyone to come together in fighting against this universal epidemic which knows no boundaries. “Cancer is the second leading cause of death worldwide with Samoa being the second highest killer after the cardiovascular diseases. Mortality is high because of the limited primary health care and cancer treatments and the lack of effective screening programs delay diagnosis at the stage where some cancers are easily treated,” he said. But why is cancer the second highest killer in Samoa after cardiovascular disease? Tuitama didn’t mince his words when he pointed the finger at the “limited primary health care and cancer treatment and the lack of effective screening programs”. We appreciate the Minister’s honesty in acknowledging the shortcomings of the country’s primary health care system – the acknowledgement is the first step towards finding a long-term solution, working in partnership with important stakeholders such as the Samoa Cancer Society (SCS) and donor partners. Okay so what are the risks of a man or a woman developing cancer? The WHO has identified what it says are five behavioral and dietary risks for a human: high body mass index, low fruit and vegetable intake, lack of physical activity, tobacco use, and alcohol use. Tobacco use, according to the WHO, is the most important risk factor for cancer and is responsible for approximately 22 per cent of cancer deaths globally. While cancer causing infections, such as the hepatitis and human papilloma virus (HPV), are responsible for up to 25 per cent of cancer cases in the low and middle-income countries. The above statistics from the WHO are alarming and would have been brought to the attention of the relevant stakeholders such as the Ministry of Health. But are we doing enough locally to create a first-line-of-defence against cancer in Samoa? An assessment of the effectiveness of the Ministry of Health’s anti-smoking marketing campaign by Dr Walter Vermeulen, the Executive Director of Matuaileoo Environment Trust Incorporated (METI), should become food-for-thought for officials at the Ministry. In an interview with your newspaper, he said the issue of enforcing tobacco control laws to minimise the impact of second-hand smoking has got more to do with poor education and minimal awareness by the Samoan Government. “Educating is important and once schools are more quaint to the dangers of tobacco, the better students at a young age realise, that smoking kills and adhere to tobacco control,” he said. Anti-smoking marketing campaigns, Dr Walter added, should be proactive and eye-catching while long texts on billboards should be avoided. Reflecting on anti-smoking marketing campaigns in his young days, he said a picture of a woman smoker – before and after 20 years of smoking – had a big impact on how he saw tobacco. Dr. Walter said tobacco smoke has more than 50 toxic chemicals that cause cancer and in an enclosed area, the toxic smoke stays in the air for more than four hours – increasing the risks for non-smokers. While some sections of the Samoan population could object to the use of graphic images in anti-smoking campaigns, studies from around the world have shown that an increase in Government-led efforts to hike tobacco taxes, graphic health warnings, clean indoor air laws amongst others led to a decline in adult smoking. For example, in the Australian state of New South Wales, adult smoking prevalence dropped from 20.1 per cent in 2005 to 15.8 per cent in 2010. During that period the NSW State Government made significant investments in televised anti-smoking mass campaigns as well as graphic health warnings on cigarette packets amongst others on top of legislative mechanisms. With Samoa and the world marking World Cancer Day today, we are reminded of the efforts of those who have survived this dreaded disease and lived to tell their story. We are inspired by the story of 10-year-old champion Antonio Falaniko, who aspires to be a doctor one day to help those who are suffering. He was diagnosed with leukemia in 2011 but was declared cancer-free in 2014, thrilling his family, especially mother Georgina Fraser. “I only want the best for my son and when he was cleared by the doctors, it was as if God answered my prayers. At the moment we were advised by the doctor to monitor the food he eats and watch out for the sun,” she said. It is time for Ministry of Health to take on board the recommendations of local experts such as Dr Walter Vermeulen and to ensure the next generation of Samoans are empowered with the relevant information to make the right choices to live a healthy lifestyle. Have a wonderful working week Samoa and God bless.